By expanding to a new spacious showroom with room to show off extensive offerings of furnishings and equipment, the professionals at Ajax Pool & Spa can now better inspire the people of the Roaring Fork Valley to live more fully and enjoyably outdoors. vignettes. Julie Phelps targets Ajax’s new showroom to help the average person or contractor make improvements, but the company has the additional resources to manage a turnkey process for high-end projects through a group of contractors and landscapers with whom she works closely. Whoever the clients, they can rely on Ajax’s expertise, as Ajax’s designs have won eight international awards. The new showroom highlights the concept of outdoor rooms: outdoor spaces that mimic how people live inside their homes with a defined space and use. Julie finds that people will get the most enjoyment from the yard by applying this concept. Ajax’s collection of fine outdoor furniture displays beauty and the practicality to resist being toppled by gusty winds. She notes that there is also a lot of interest in the fire pits she carries. 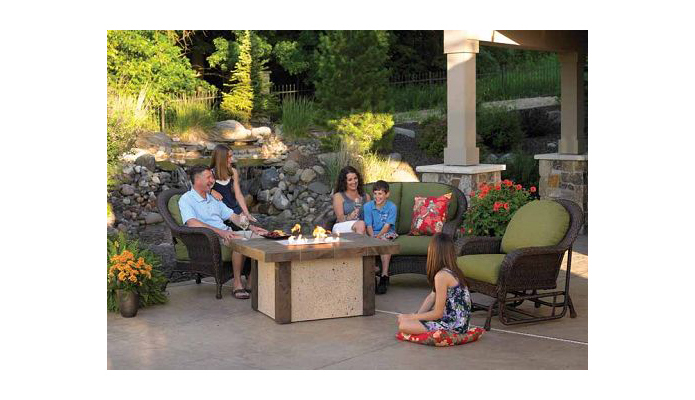 “You can think of them as anchoring a seating area outside similar to a coffee table inside, but when temperatures drop, you flick on the fire pit and the group can continue its conversation in warmth and comfort.” Ajax carries full fire pit units or components for do-it-yourselfers, along with a choice of switches or timers for natural gas or propane. “With current fire restrictions, burning wood isn’t permitted, but gas firepits are allowed,” notes Julie. Another design inspiration in the showroom is outdoor kitchens, and Ajax displays options for the barbecue equipment and creating counter workspace and storage. Julie Phelps notes that anyone can visit for ideas, and there are products for a homeowner to do the improvements, or people are welcome to talk to Ajax about a full custom design and installation. “You never see a home improvement show complete a backyard without a spa,” observes Julie. “Spas finish a yard like icing on a cake.” Ajax has carried the Jacuzzi brand since 2003, and the new showroom doubles the amount of premium spas on the floor. “It gives people a chance to see the products and determine what will work for them. Most active people have something going on with their body that can be relieved by a Jacuzzi, and our showroom lets people see choices in jet configurations. The Jacuzzi 50/50 water to air ratio is designed for therapeutic use,” Julie explains. Ajax is especially proud to represent Tidal Fit swim spas. When asked why it stands out, Julie explains that a pump similar to a propeller provides the resistance, and it offers a better swimming experience. Ajax also designs and builds custom pools, spas, and water features that are never short of fabulous. Ajax continues to offer spa and pool maintenance and repair with their certified and Five-Star-rated staff, which is a major industry accomplishment. “As a company, we are active in national organizations for training, certifications, and staying current with trends, products, and standards,” Julie notes. “It is very important to me that we are highly trained.” Service carries another meaning at Ajax. Ajax takes an active roll in local charities and community action. “We have stepped up to the plate to offer people in this valley what they need to enjoy their homes outdoors, and now we ask them to take the plunge,” Julie adds with a final word play.